Methylprednisolone sodium succinate is a water-soluble ester of METHYLPREDNISOLONE used for cardiac, allergic, and hypoxic emergencies. 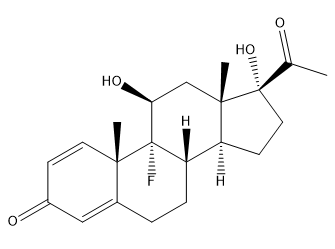 Cortisone acetate is a steroid hormone that has both glucocoriticoid and mineral corticoid activities. 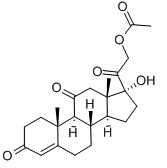 AL082D06, also known as D-06, is a nonsteroidal glucocorticoid receptor antagonist. AZD7594 is a potent selective nonsteroidal glucocorticoid receptor modulator, with an IC50 of 0.9 nM. RU 43044 is a selective glucocorticoid receptor antagonist that has shown an antidepressant-like effect. 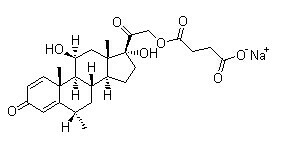 Fluocinolone Acetonide is a glucocorticoid derivative used topically in the treatment of various skin disorders. Exhibits antiallergic and antiasthmatic effects. Also used as a topical anti-inflammatory. Flumethasone is an anti-inflammatory glucocorticoid. Fluorometholone is a synthetic glucocorticoid that binds to glucocorticoid receptors (IC50 = 1.5 nM; Kd = 2.8 nM in a radioligand binding assay).